This is the fourth ad in Apple’s line of popular Siri commercials. Martin Scorsese (via MacRumors) follows Samuel L. Jackson, Zooey Deschanel, and a pair of stinkers with John Malkovich. Scorsese is found in his natural environment—on the streets of Manhattan in the back of a cab. I believe this is the first time Find My Friends has been used in a commercial, but do not quote me. 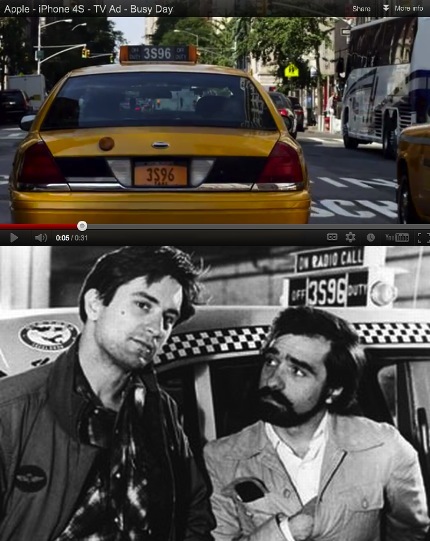 Update: Redditor begotabu points out that the cab number of the taxi is the same as Travis Bickle’s in the Scoresese classic Taxi Driver. Ha!